This is so simple yet it's so yummy to eat as a side with rice and some sort of protein (stir fry, stew, anything Asian, etc.). In a medium mixing bowl, toss cucumbers with a pinch of salt. Set aside for 5 minutes. Meanwhile, bring a pot of water to boil. Blanch bean sprouts. Rinse under cold water and squeeze out as much water as possible. 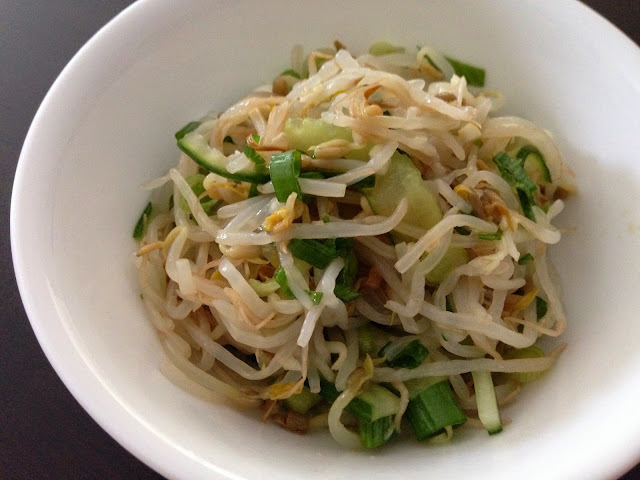 Add bean sprouts to cucumbers. Mix in green onion, sesame oil and garlic. Taste and add more salt if needed. (Optional) top with sesame seeds. Serve with rice and some sort of Asian okazu or alone.